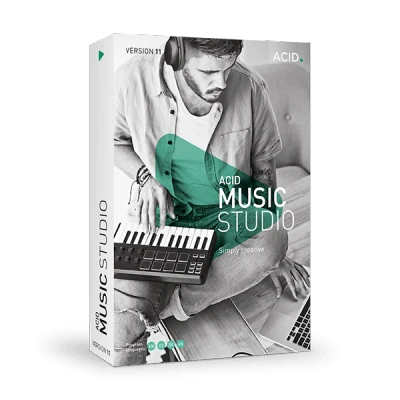 ACID Music Studio 11 gives you complete freedom to create music your way, while still being incredibly easy to use. Based on its older brother, the legendary ACID Pro, Music Studio features a sleek, new interface with a lot more power under the hood, thanks to its revamped 64-bit engine. It also comes with inspiring new content that will empower any producer who wants to make better music. ACID invented and defined the concept of creative loop-based music production over 20 years ago. It blazed the trail for slick and straightforward music production and, in ACID Music Studio 11, we have made it even easier for you to produce fantastic tracks, remixes and even DJ sets. ACID loops are no ordinary loops as they come with hidden extras beneath the surface. Every ACIDized loop has pitch, length and transient data so you can easily mix and match loops to create songs in an instant. The best music production software comes with an array of plug-in instruments with which you can create your tunes. ACID Music Studio 11 covers all the bases with a suite of eight top-quality Vita Solo instruments. This is the perfect instrument for your beat needs. It contains enough kicks and hits for many genres – from hip hop to dubstep – and it's easy to program too. Just play the pads and hit record. Drum Engine features a similar interface to the legendary Akai MPC sampler, so you can easily create incredible grooves. Choose from a wide variety of kits and sounds to make beats in a range of styles. We meticulously sampled the sounds of a concert grand being played in one of the best concert halls to bring you this incredible piano. All the power and detail of the real instrument shines through. This is a great drum instrument for many chart music genres. Play huge traps beats, thumping techno or furious metal, all from a single top-quality instrument, loaded with great sounds. All your vintage electric piano needs are catered for here. It's great for smokey jazz, soulful blues or swinging funk, with on-board effects adding to the authenticity of the sound. Play a variety of real instruments with this flexible sampler. With an on-board filter and effects you can also shape and add richness to any sound. This is a very powerful analog synthesizer which can create great electronic sounds – from vintage analog to punchy EDM. Add the dynamic power of rock to your music! All the heavy drums you could ever need: from driving metal to powerful live beats that sound like they're being played by the biggest bands in the world! … And ACID Music Studio will do the rest. You will enjoy pro-quality, 24-bit, 192 kHz multitrack sound, all powered by Music Studio's 64-bit engine. ACID Music Studio features the same sophisticated MIDI editing features that you'll find in high-end music software, but it makes MIDI easy! You get very user-friendly tools and a clear environment that makes editing in ACID Music Studio fast, friendly and hassle-free. Use familiar piano-style editing for your notes and drum-grid editing for your beats. Adjust note positions, volumes, pitch-bend and other information, all within one window to improve your workflow. Create great rhythms by adding, deleting and programming beats directly in ACID Music Studio's timeline using the grid-style editor. You'll be making great beats in no time! It's easy to create audio tracks from the notes played by your software instruments. This means fewer instruments running, so frees up valuable CPU processing power. You can easily select and edit multiple MIDI events or tracks in ACID Music Studio 11. This saves time when you quantize, change the volume or edit the length of multiple notes. With ACID Music Studio 11's envelope and keyframe automation features you can record smooth changes for anything – from the note's volume and pitch, to the controls on a virtual instrument. In ACID Music Studio 11 you can create and edit drum and patch maps. These are used to label preset sounds and drum names for both hardware and software-based synths and drum machines. Make your music sound great. ACID defined real-time audio editing and now ACID Music Studio 11 is packed with some of the most powerful audio tools available in any DAW. ACID Music Studio 11 features a powerful virtual mixer so you can route all of your MIDI and audio tracks together and adjust levels – just like in a recording studio! ACID Music Studio 11 has plenty of effects – including all new eFX Flanger, Phaser and Delay – to give your music a polished sound. Thanks to its automatic time-stretching and the ACIDized loop format, your music productions will always stay in time and in key. Now here's the fun part of ACID Music Studio 11. The software has unique tools like Beatmapper and Chopper which help you create remixes with chopped and sliced effects. It's easy to remix music in ACID Music Studio 11. You simply create a Beatmap song which locks to the tempo and time-signature of any imported samples, allowing you to mix, remix and put different ideas to together in an instant. Chopper is an incredibly creative tool that allows you to slice up an audio file, re-order its contents or completely change its groove. Create amazing rhythmic variations for remixes that always stay in time with your project. Twist and turn your sound. With ACID Music Studio 11, your music can be transformed with all-new vintage simulations and dynamic effects. eFX Chorus Flanger: This has everything from subtle chorus to dramatic flanging, with complete control over a sound that will add depth to your music. eFX Phaser: Experience the classic phasing effect which guitarists love, and apply it to anything you like for more movement and attitude. eFX Stereo Delay: Fully adjustable delays plus a tempo-sync feature mean that you can go wild with echoes and repeats, but they will always sound great. eFX Limiter: Turn it up! Increase the volume of your audio signal and prevent it from clipping. Get some vintage warmth in your sound with this compressor and tape simulator that offer ultra-realistic modelling of classic analog gear. Enjoy the classic sound of guitar and bass amplifiers! You get the complete set-up – stomp box, amp, speaker and microphone – but can control it all from your software.